some excerpts - for the full sermon go to the dici website. …Now, to speak about the future, what we will try to do with the Roman authorities is to tell them that it does no good to pretend, for the sake of the faith, that the Church cannot be mistaken. Because, at the level of faith, we are entirely in agreement about the assistance of the Holy Ghost, but you have to open your eyes to what is happening in the Church! It is necessary to stop saying: the Church can do nothing bad, therefore the new Mass is good. It is necessary to stop saying: the Church cannot err, and therefore there is no error in the Council. But look at reality then! There can be no contradiction between the reality that we apprehend and the faith. It is the same good God who made both. Therefore if there is an apparent contradiction, there is certainly a solution. Perhaps we don’t have it yet, but we are not going to deny reality for the sake of the faith! Now this is truly the impression that one has with regard to what Rome is trying to impose on us today. And here we reply: we cannot. That is all. 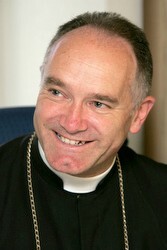 "We have lost one of our four bishops" says Bishop Fellay "We can't use him for anything anymore." He had hoped and believed that Bishop Williamson had understood things better in the meantime (since Jan 2009) but unfortunately Bishop Williamson has not understood. 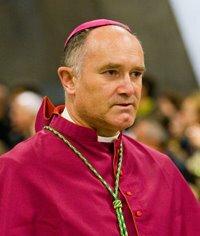 Bishop Fellay likens Bp Williamson to uranium, "it's dangerous when you have it but you simply can't leave it by the side of the road". Bishop Fellay speaks about the internet. Extracted from an interview 2009. I do not see so much of a difference between the Internet, television, radio, the press, and the media in general. We can basically say, for all of these things, that the children of the world are wiser than the children of God. Taken by itself, the Internet is a means, and the right use of a means will bring good fruits; the wrong use will bring bad fruits. Now, it's not simply a means; it's a very powerful means because you can reach the whole world. It's very impressive, but this ability is something which has never happened before in history. The radio was seen as a novelty because it was able to reach millions of ears; the television was more since it could capture eyes; the Internet makes it possible for anybody at a very low cost. There is no comparison then between the Internet and these other things. That means whoever wants to say something whatever it is he may do it. This is one of the truly major problems of the Internet and of Tradition. You have people who have an idea of Tradition maybe correct, maybe incorrect and who simply talk. Whoever has access to what is said does not necessarily know what is right or true. This is a very serious and grave problem. When you talk about preaching the truth, the Church has this mission. The Society, as part of the Church, participates in this duty to spread the truths of Revelation. But now everyone can pretend to have authority with great ease. Of course, they have no authority, but everybody imposes themselves as Doctors of the Faith today. There is usually no way to check the quality of the one who speaks. It is a very embarrassing problem. We have experienced, for years, a major problem there. We have people who, for example, attack us unjustly with calumnies, and there is almost no way for us to stop them. Thus, whoever wants to listen to them may do so. By doing so, they may endanger their trust in the Society. I would go so far as to say that, by putting this relationship with the Society in danger, they easily fall into mortal sin. When you see the trash, hatred, and calumnies spread on some sites , you realize they are dangerous places. And you have no right to expose yourself to dangerous places. The Internet is quite a challenge. On the one hand, it is now a common means of communication, even the normal method today. So we are obliged to use it. We may not simply ignore it. There is a great need to educate people in how to correctly use this means. We express our filial gratitude to the Holy Father for this gesture which, beyond the Priestly Society of Saint Pius X, will benefit the whole Church. Our Society wishes to be always more able to help the pope to remedy the unprecedented crisis which presently shakes the Catholic world, and which Pope John Paul II had designated as a state of "silent apostasy." Besides our gratitude towards the Holy Father and towards all those who helped him to make this courageous act, we are pleased that the decree of January 21 considers as "necessary" talks with the Holy See, talks which will enable the Priestly Society of Saint Pius X to explain the fundamental doctrinal reasons which it believes to be at the origin of the present difficulties of the Church. In this new atmosphere, we have the firm hope to obtain soon the recognition of the rights of Catholic Tradition. Bishop Bernard Fellay, head of the Society of Saint Pius X, has told SPIEGEL that his organization has "clearly distanced itself" from Bishop Richard Williamson. Nevertheless, he says the bishop's apology for his Holocaust denial is a step in the right direction. SPIEGEL: Bishop, weeks ago you gave your colleague Richard Williamson a book so that he can read up on the Holocaust. Last week he published an apology which falls short of the Vatican's demand that he retract his Holocaust denial. Does Williamson's statement suffice in your opinion? 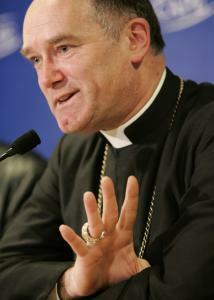 Fellay: It is definitely a first plea for forgiveness and, therefore, an important step in the right direction. One can always hope for better phrasing. At least the plea for forgiveness is honest, and the withdrawal of his words is genuine. SPIEGEL: That hope seems unfounded. After his arrival in London, Williamson surrounded himself with people who have openly denied the Holocaust, such as the historian David Irving. Do you know why? 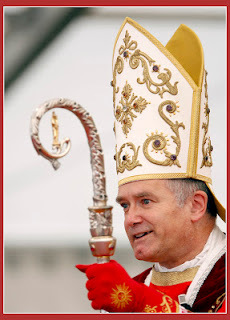 Fellay: I have the impression that Bishop Williamson is being used by these people. Information was deliberately fed to the media here. We're working against that as well as we can. I am totally against these connections. SPIEGEL: But your influence on Williamson seems to be weak. Fellay: We are in contact, he is in a priory of the society in London for the time being. But he is also a free human being. Sure, he has a superior, but he is free in his decisions. But he has to bear the consequences for that. SPIEGEL: Will he return to his full duties? Fellay: That is impossible under the current circumstances. He has damaged us and hurt our reputation. We have very clearly distanced ourselves. He was not ordained as a bishop for his own personal purpose but for the common good of the church, to spread the revealed truth. SPIEGEL: So why don't you exclude Williamson from the society? 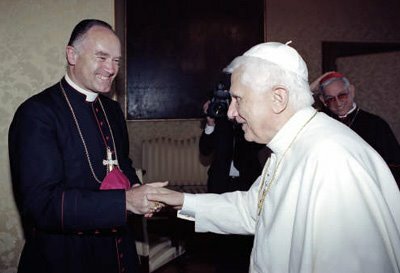 Fellay: That will happen if he denies the Holocaust again. It is probably better for everyone if he stays quiet and stays in a corner somewhere. I want him to disappear from the public eye for a good while. SPIEGEL: The Vatican could reinstate the excommunication because he has not made a retraction. Fellay: I doubt that. Denial of the Holocaust, as serious as it is, isn't part of Canon Law -- so an excommunication isn't possible. It isn't just we who say that, it is canons, legal experts. The problem is that his comments have been linked to his office. SPIEGEL: Regensburg's Bishop Gerhard Ludwig M"ller has denied the German Pius seminary in Zaitzkofen permission to ordain more priests. Will you adhere to the ban? Fellay: That was unnecessary and inappropriate. All these events definitely are a setback for us. It throws us back by 10 years. But ordinations will continue to happen. SPIEGEL: In Germany politicians fear that schools run by the society don't share the values of the German constitution. Are you concerned that there will be inspections? Fellay: I'm not worried about that at all. We are normal people. We observe the rules, and that includes the state order. Even if one voice said something wrong. It is expressly written in the epistles of the Saint Paul that we honor authority and pray for it. SPIEGEL: So Williamson is someone who has gone astray and criticism of the society is a big misunderstanding? 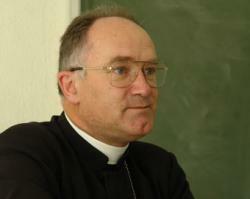 Fellay: Now we're the world's scapegoat, and every wrong step immediately turns into a scandal. But mistakes that need to be corrected are made all the time and everywhere. SPIEGEL: Why did you respond so late to Williamson's crude theses? Fellay: I confess that I didn't take the situation seriously enough. Interview conducted by Stefan Winter. 2nd March 2009.